Wheels is a rock star when it comes to choosing cards! We became officially engaged on June 10 – my parent’s wedding anniversary. We were apart for much of our engagement, but on the tenth of the month without fail I would receive a “monthiversary” card from him. And after we were married, the sweet, heartfelt cards continued four times a year. My birthday, our anniversary, Christmas and Valentine’s Day. I treasure every one — but I never go back to reread them and they are usually in a box in the closet. And this year, I decided the Valentine cards deserved to be showcased! I went through the box and chose nine cards about the same size and with a white, gold or red color theme. Then I punched a hole in the corner and tied each card onto a Christmas string of red beads. I dove into the stash and came up with ten hearts, and a pile of scrapbook embellishments. I spelled out V-A-L-E-N-T-I-N-E on the hearts and embellished them with glitter, buttons and other pretties. Then I fastened them to the beads between each of the nine cards. Needed a little fluff –curlies, and silk posies. Some more cards on the mantel, the pink rose wreath on top of the silver mirror, and a little more fluff. You can find a little fluff at your house to make February 14 — or any day — a special day and celebrate relationships with the special people in your life, too! This post was featured at Kristen’s Creations. Thank you! Celebrate with A Pinch of Joy! Follow on facebook, twitter, RSS, bloglovin’ or sign up to receive new posts by email. If you see something you like, please use the share buttons below! Happy Valentine’s Day! Your Mantel is so Cute! Thank you for sharing with us on six sister’s stuff! We hope to see you next Saturday! Very pretty! Love the cards and the story behind them! Thanks for sharing. I shared it on my FB page today too! 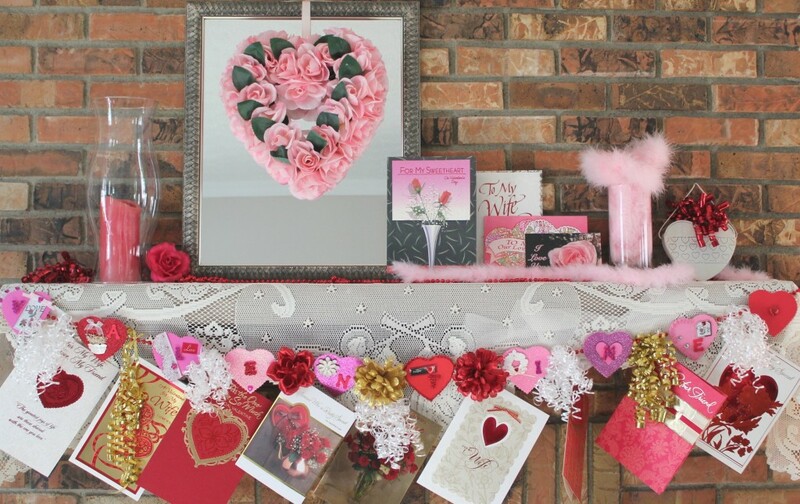 Love your mantel, I always hang my Christmas cards but never valentine cards, so this looks really cute. So special all the cards are from your love. also like the banner. You mantel is really cute. Thanks for sharing your creative inspiration at Sunday’s Best Par.tay!